Stylized disk images made easy. Effortlessly build disk images with your own beautiful design. Simply drag and drop your files, design your disk image's appearance using the rich visual editor, and click "Build" to easily and quickly create a fully assembled disk image ready to ship. Each time you release a new version of your disk image, simply click "Build" again, or automate it as part of your own build process using the built-in command-line tool. Simple drag & drop editor to layout the position of each file in the disk image. Add images and stylized text to the background when the dmg is displayed in Finder. For the companies needing to ensure the user has seen the license agreement upfront. Clicking the "Build" button is easy, but automating the building makes it even easier. Making disk images shouldn't be hard. With DMG Canvas, simply give your disk image a background image, drag and drop files onto the window view, and click Build. 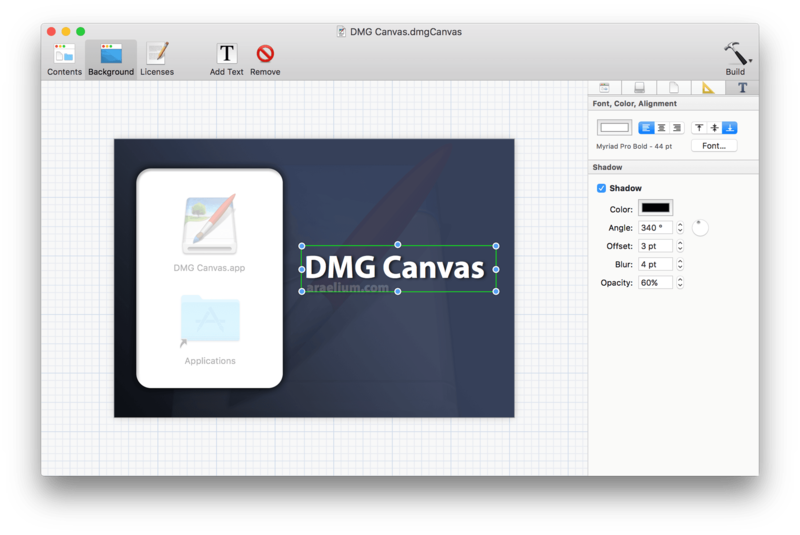 What you see in DMG Canvas is exactly how it will look in Finder. Using the Background layout view, you can create great backgrounds for your disk images right inside DMG Canvas itself. Just drop in images, add customized text, and you're done in a snap. 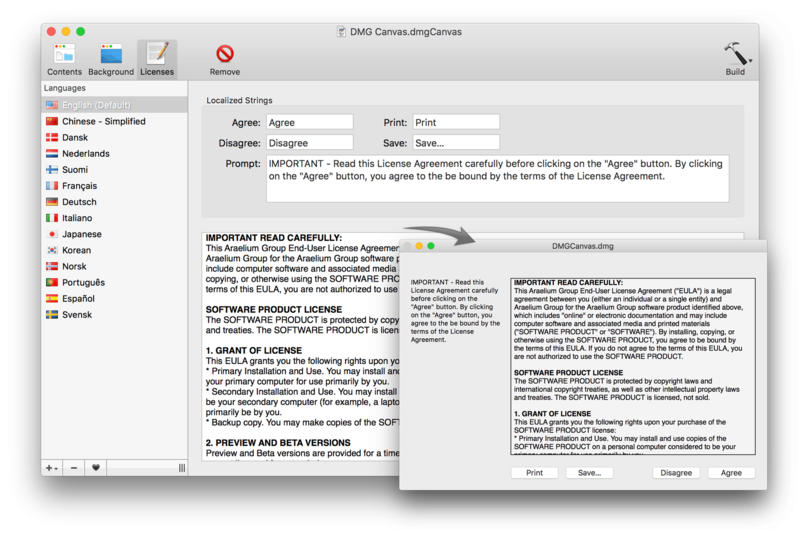 Do you need your disk image to prompt a license agreement when mounted? Not a problem. Don't spend hours trying to figure it out yourself; Just put your license's text into DMG Canvas and you're done. It even supports styles and multiple languages. Ensure your customers and macOS itself know that the disk image is safe and secure with code signing. Gatekeeper in macOS Sierra enables extra security features if your disk image is not code signed, potentially breaking behaviors in your application. Using DMG Canvas, code signing is as easy as a single click. 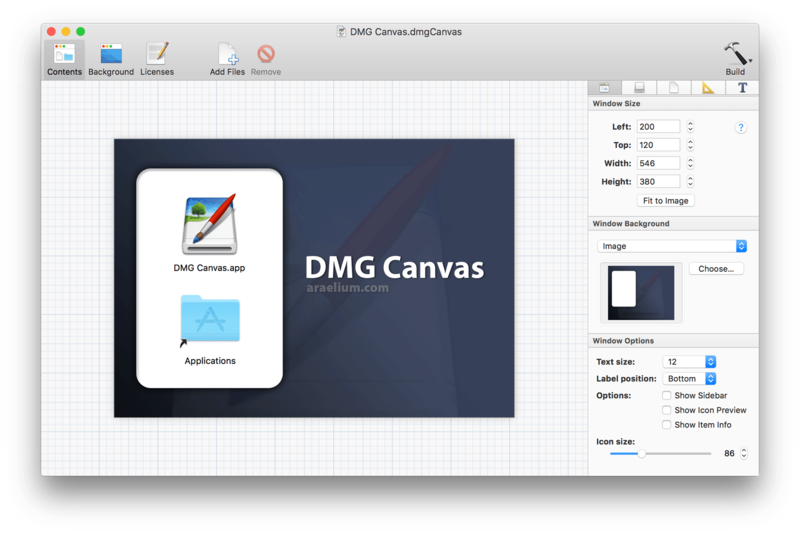 DMG Canvas goes the extra mile and carefully creates disk images with maximum compatibility so they look and work great all the way back to OS X 10.4, regardless of which version of OS X you're using. 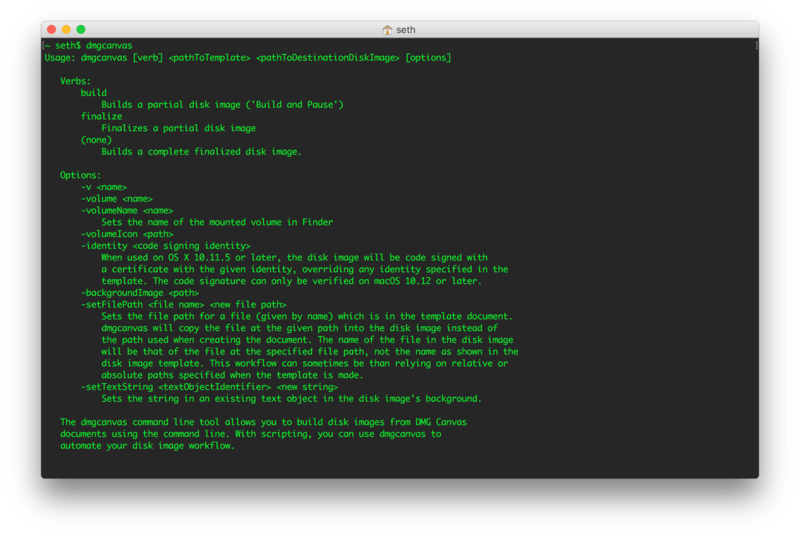 When targeting OS X Lion and later, add beautifully crisp Retina images and text to your disk images. Your users (and potential users) will see your attention to detail before they even launch your application for the first time. DMG Canvas lets you create and build disk images using the slick WYSIWYG designer. Simply drag and drop your files into place, add text, images, and change the background image for the mounted window, and you can even add stylized license agreements to your disk images, which — believe us — is a massive pain otherwise. Even though clicking the "Build" button in DMG Canvas is a piece of cake, why click it if you don't need to? By using the dmgcanvas tool, you can integrate building your disk images into your normal build workflow, such as building an application in Xcode, so you won't even have to think about making a disk image; It's already done for you. And to satisfy macOS Sierra's Gatekeeper, you can now code sign your disk images with your Developer ID certificate, avoiding troublesome Path Randomization. DMG Canvas does it all.